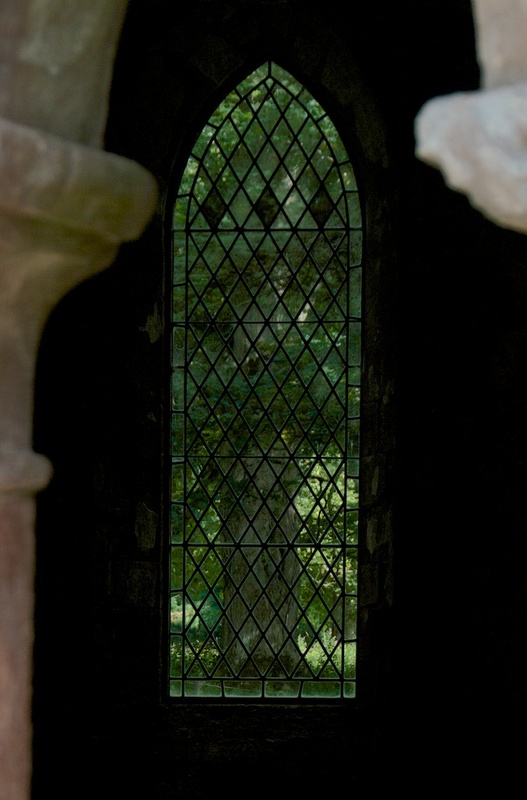 Some of the places I visit make me wonder whether the feeling of deep stillness existed before they were built, or whether it came about because of the devotion and serenity of the people who lived there afterwards. 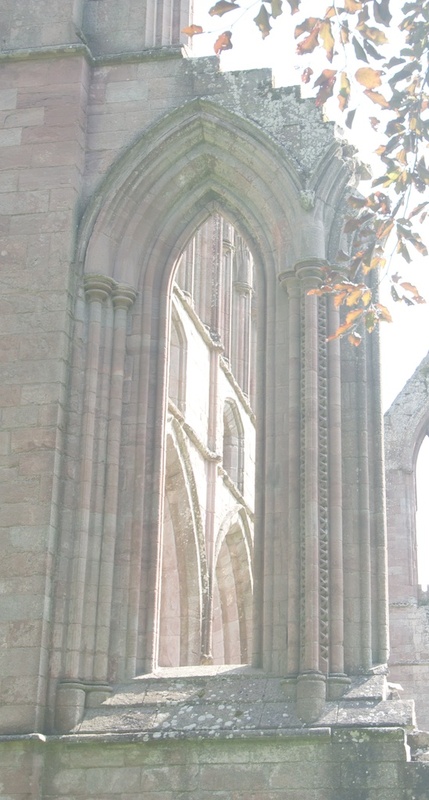 Dryburgh Abbey is one of those places. 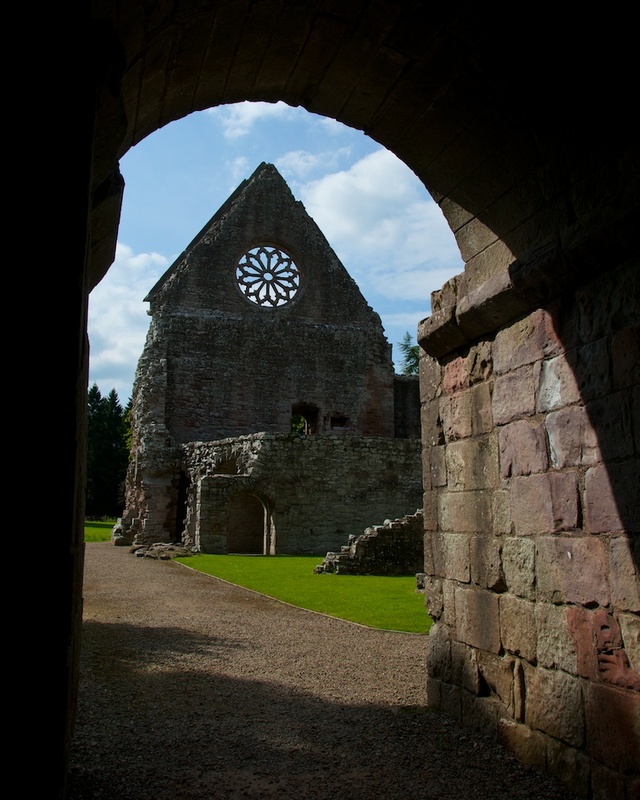 The first Christian worship at Dryburgh may have taken place around 600 AD, when a missionary called St Modan – or some of his followers – chose a loop in the River Tweed for the location of a simple church. However, no physical evidence of this has yet been found. It was down to Hugh de Moreville in 1150 to make the next step, when he invited a group of Premonstratensian monks to settle by the river. De Moreville was a local landowner and a friend of David I; in later life he became a novice at the Abbey, and died there in 1162. In the course of my abbey wanderings I’ve come across Augustinians, Cistercians, Culdees, Tironesians, Valliscaulians… but I’d never even heard of the Premonstratensians. The name comes from Prémontré in Northern France, which is where the order originated. The Premonstratensians are an order of white-robed canons, and by the 12th century they had six Scottish houses including Whithorn in Galloway. 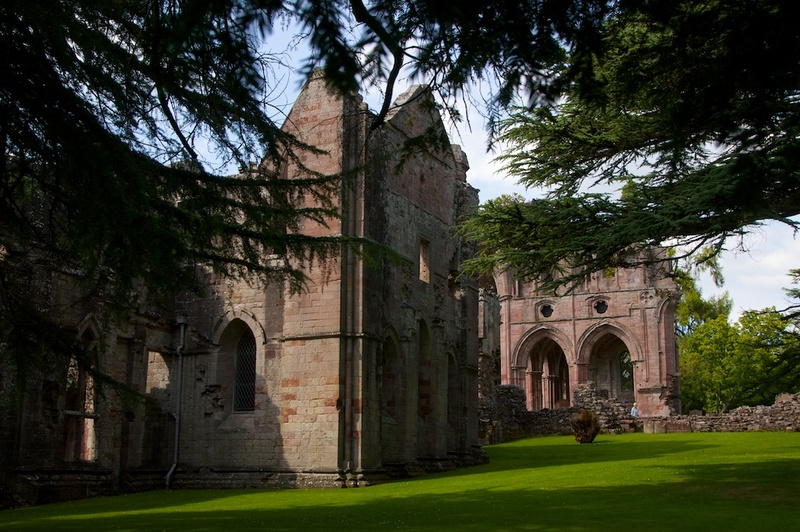 The monks who came to Dryburgh were from Alnwick Abbey in Northumberland. The work of building an abbey and its attendant church was a huge and long-lasting task, and it seems to have taken the best part of a century. The result was magnificent, but unfortunately it was only about 70 years before trouble came knocking at the door. In 1314 Robert the Bruce had trounced the English at Bannockburn, but in 1322 Edward II mounted a comeback and advanced across the border with a force of over 20,000 men. The Bruce outwitted him again, withdrawing his own troops further north and laying waste to the countryside in their wake, making sure that the English army either halted or starved. His tactics worked, and the weakened soldiers began to file back across the border country. 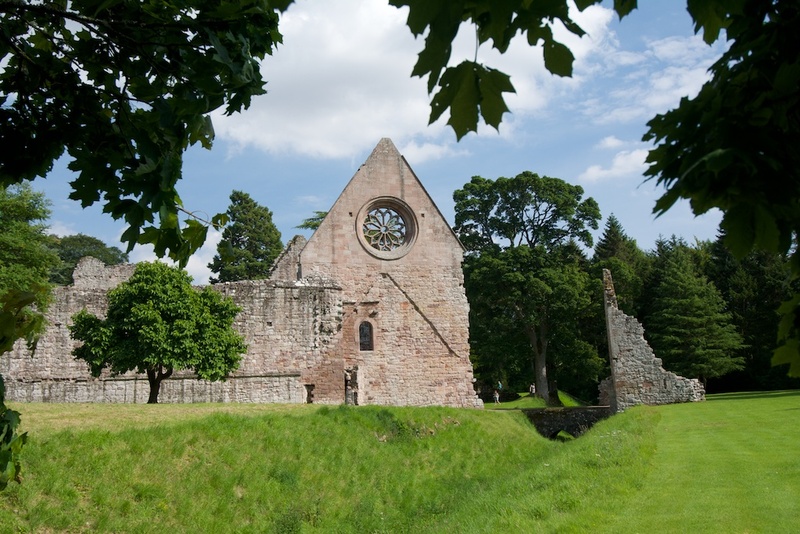 At Scottish churches and priories the order was given to ring the bells and declare the good news to the countryside… but unfortunately for Dryburgh, the command came just a little too soon. When the peals reached the offended ears of the retreating English, some of them made a swift detour and burned the abbey down. 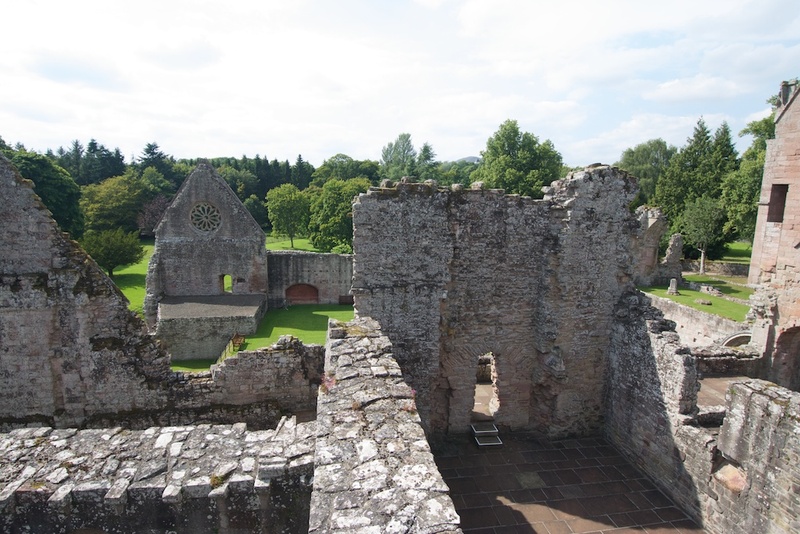 Robert the Bruce made a generous contribution towards the abbey’s repair; but, far from being a one-off event, the attack seemed to set a precedent for future centuries. 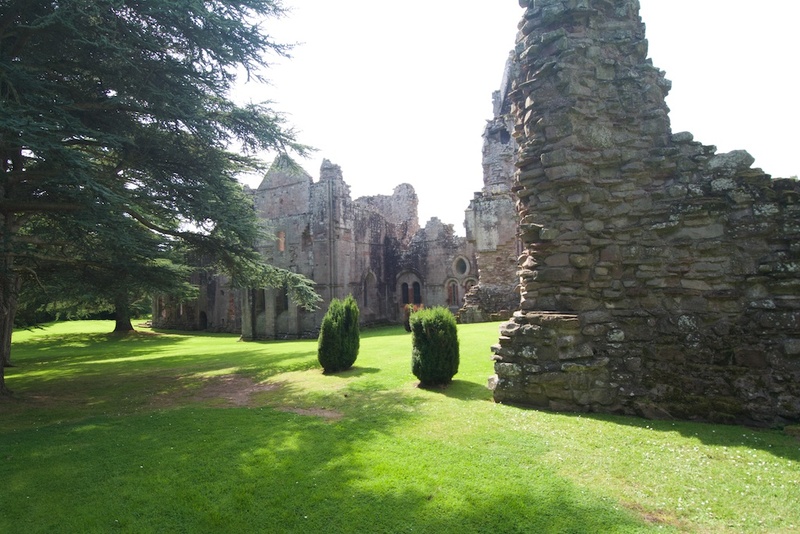 The abbey was burnt again in 1385, 1461 and 1523, meaning that it must have been in an almost continuous state of re-building. That ‘protective’ loop in the river was obviously no deterrent at all. If the church survived the raids it was no match for the Reformation, and by 1560 it stood in ruins. Life wasn’t quite extinct, however: records show that there were still two plucky canons in residence in 1584. 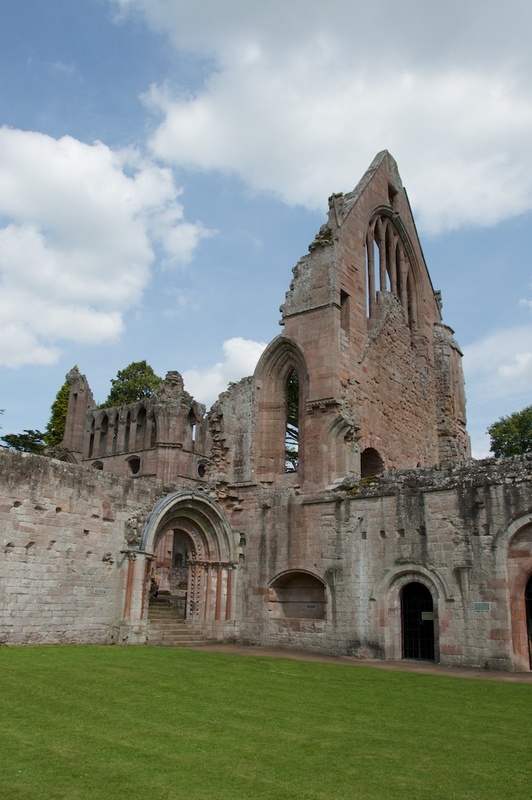 Mercifully, they were allowed to continue their lives at Dryburgh in peace. 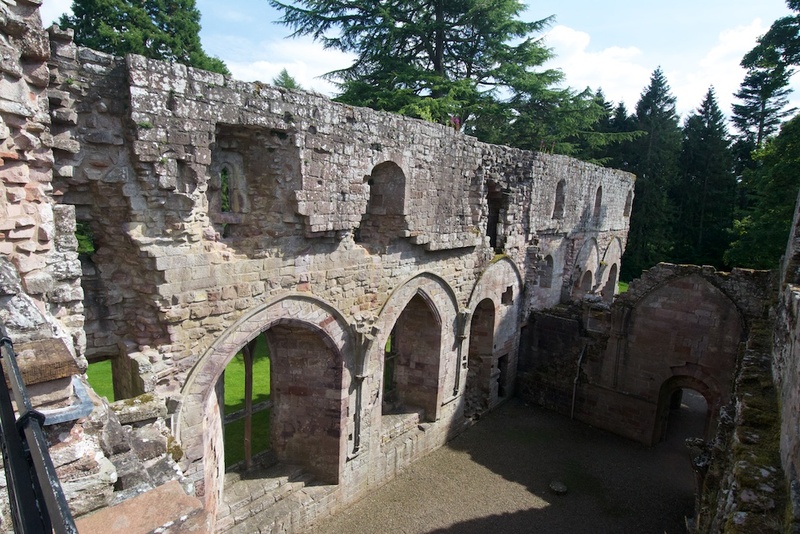 David Erskine, 11th Earl of Buchan, acquired the Abbey in 1786, and dedicated much of his life to preserving the ruins. 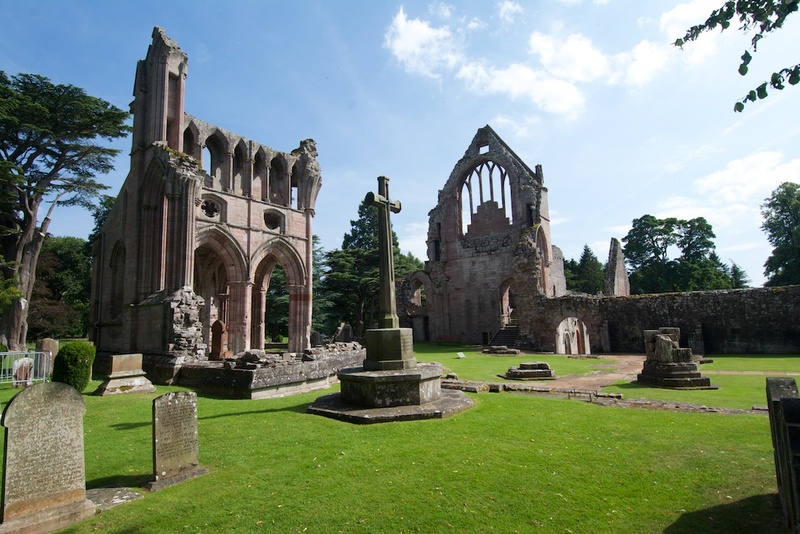 With the Victorians’ passion for Gothic romance and crumbling splendour, it isn’t hard to see why Sir Walter Scott chose Dryburgh as his last resting place. He is buried in the north transept of the church, otherwise known as St Mary’s Aisle, alongside Earl Haig of Bemersyde and members of the Haliburton family. 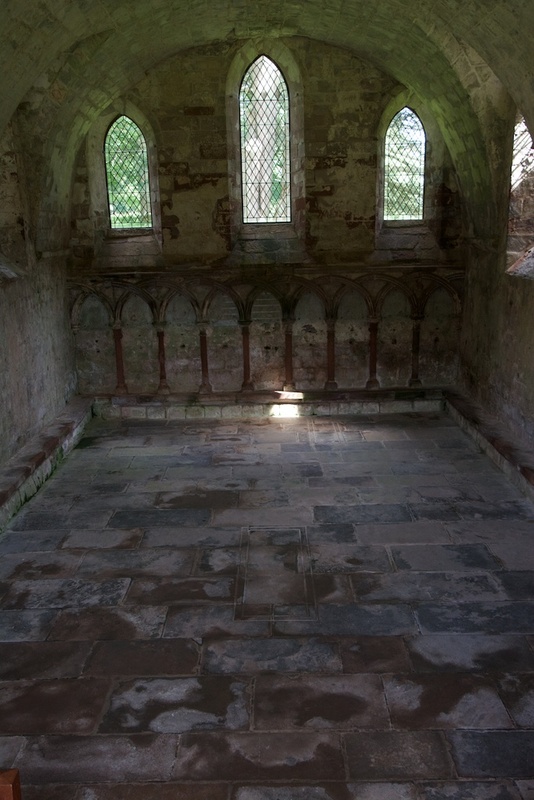 Above this transept, in former centuries, would have been the choristers’ gallery. At first glance the church feels strangely fragmented because parts of it have disappeared altogether, but once you have worked out where the altar was the rest falls into place. The living quarters have fared better, and it’s possible to wander in and out of the dormitory, library, cloister, warming house and refectory. Of all the narrow, winding stairs I have climbed (and there have been a few), the one at Dryburgh has the best ‘surprise factor’, because it leaves you literally stranded in mid-air, protected only by an iron rail, looking dizzily down on the ruins and seemingly at arm’s length from the tops of the tall trees in the park. 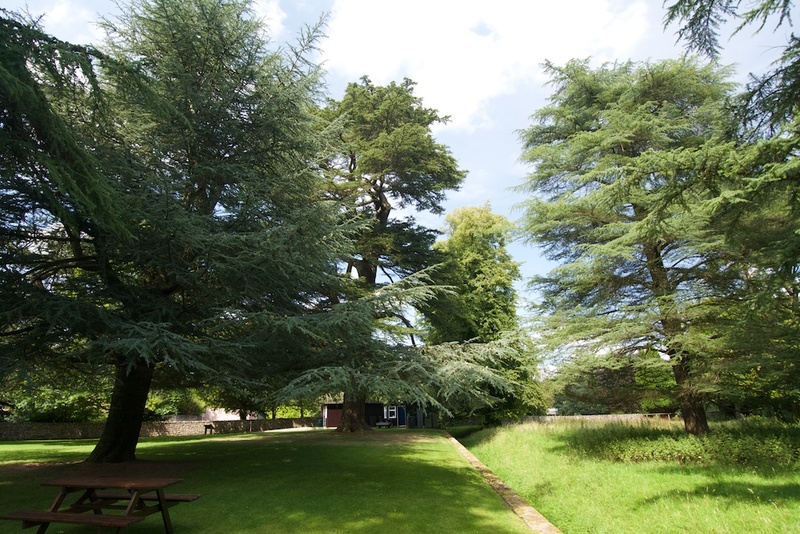 Before you even glimpse the sandstone ruins, the path through the grounds leads you past some huge trees, giants by Scottish standards at least, including a Wellingtonia and a blue-green cedar that was laden with cones. I am beginning to think that time slows down around very large and very old trees – on a warm afternoon, their coolness and shade made me feel as if I was stepping into a pool. 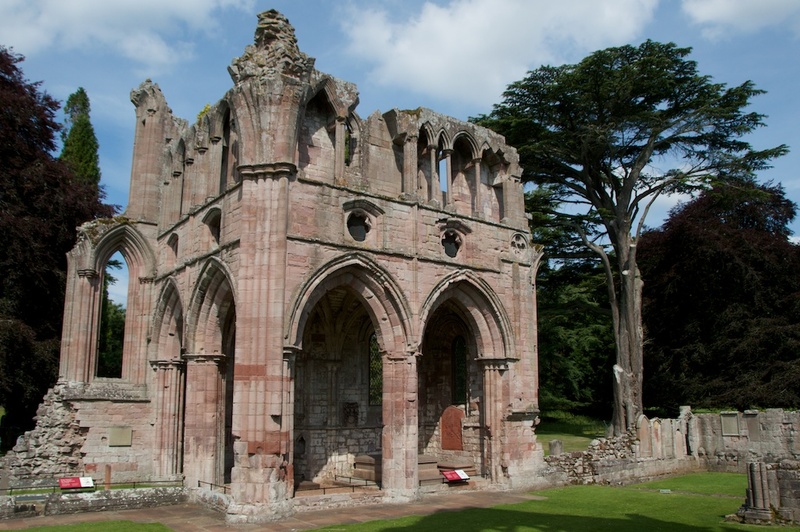 Believed to have been planted by the monks of Dryburgh in 1136, this veteran is well on its way to being 900 years old. 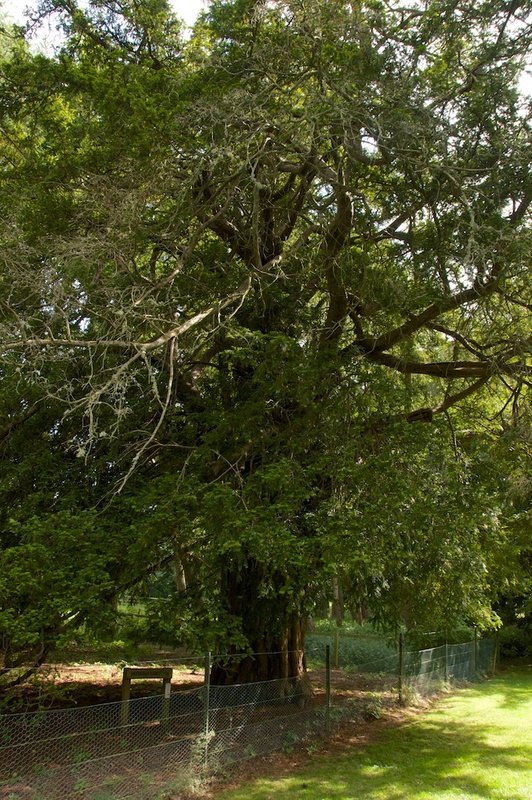 In 1837 its girth measured 12 feet, and in 1890 it was 14’3”; I cannot find a more recent statistic, but the tree is still in vibrant health. I always despair when I try to photograph yew trees: they seem to have no beginning and no end, no defined edges and no recognisable shape. It’s almost as if they are embracing the infinite in every possible way! The deer, half-seen, are to the covert wending. And herd-boy’s evening pipe, and hum of housing bee. 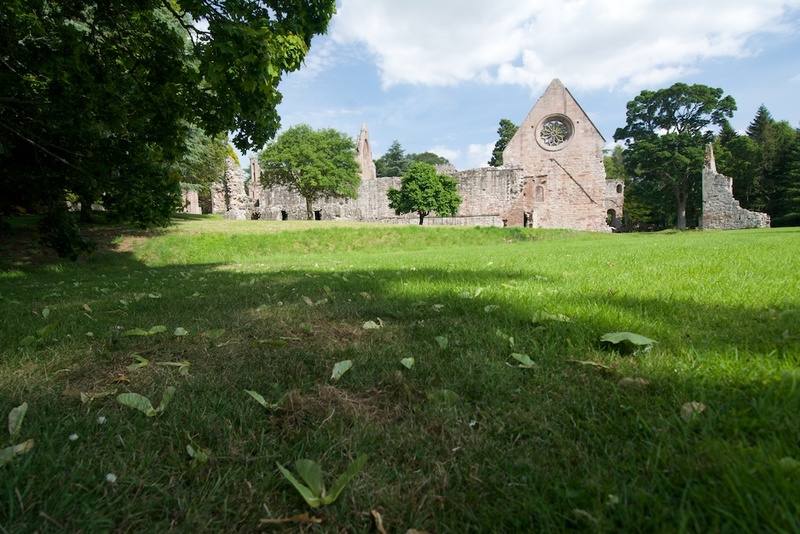 More information on visiting Dryburgh Abbey can be found at Historic Scotland. Thank you…this brings back fond memories…. A very interesting post Jo, with some great photos. I love the way how you describe that you feel like time slows down when standing near large old trees……………..I’d not thought of it in that precise way before, but you have it absolutely spot on!!! 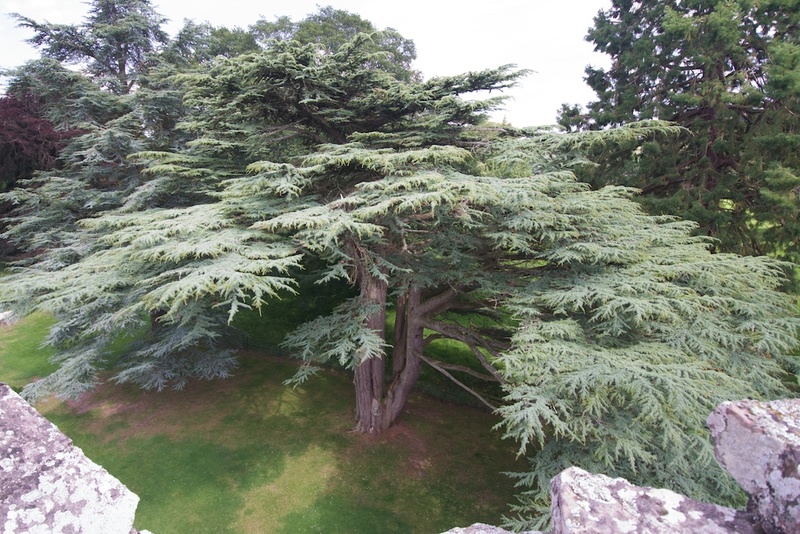 Yes, I think you are absolutely right about yew trees, Pat! They know no boundaries. Thank you very much, glad you enjoyed the post! 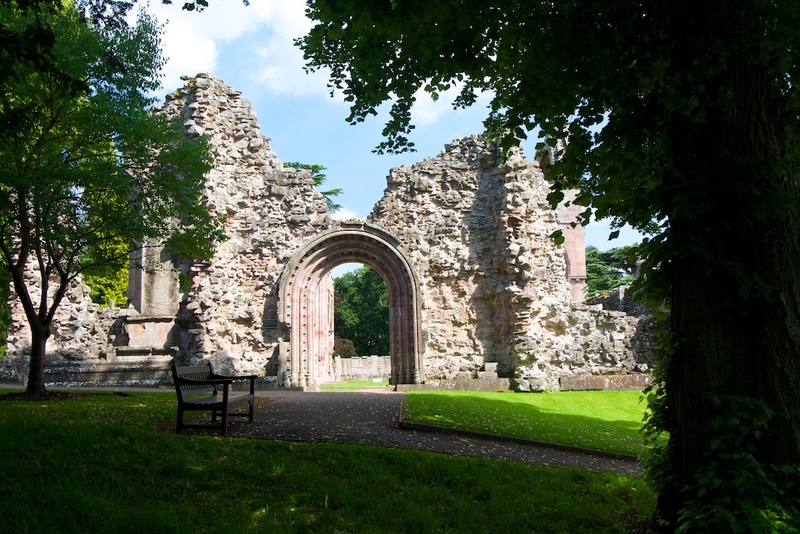 It’s surprising just how peaceful Dryburgh is, when you think of all the troubles it has had. Those monks of ancient times could give a great training to modern builders in how to build to last! Thank you for the tour and terrific pictures. They could, Viv – I often think that myself. It was a true labour of love and it didn’t matter how long it took. Glad you liked the post – thank you! Thank you, Justbod, that’s very kind! There were a handful of other people there but somehow we managed not to get them in the photos! 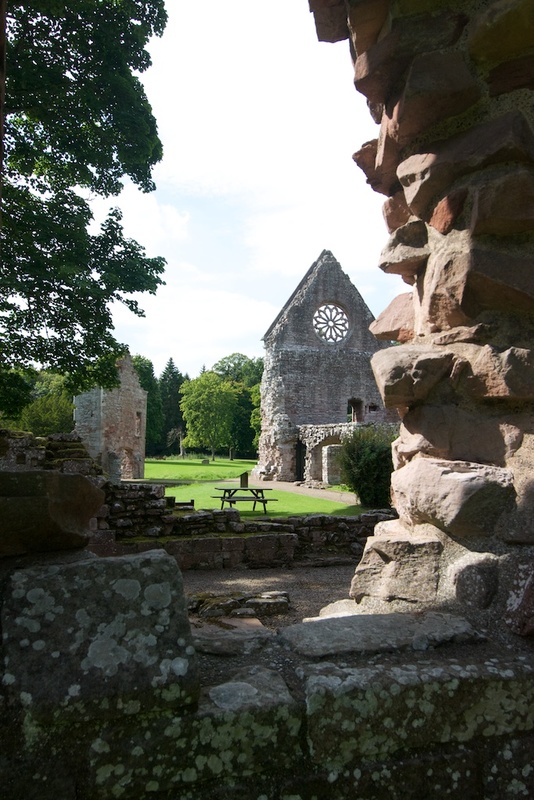 Dryburgh is one of those places that seems to have a lasting effect – the peace kind of stays with you. It’s beautiful. Lucky you….the few times I have been to Dryburgh it has either rained (heavy) or been cloaked in mist……so another location for a nicer day! We certainly were lucky, David. Although I’m sure it is very ethereal cloaked in mist! Your posts are always so meticulously researched and interesting to read as well as beautifully illustrated. Thank you. Thanks, Scott! 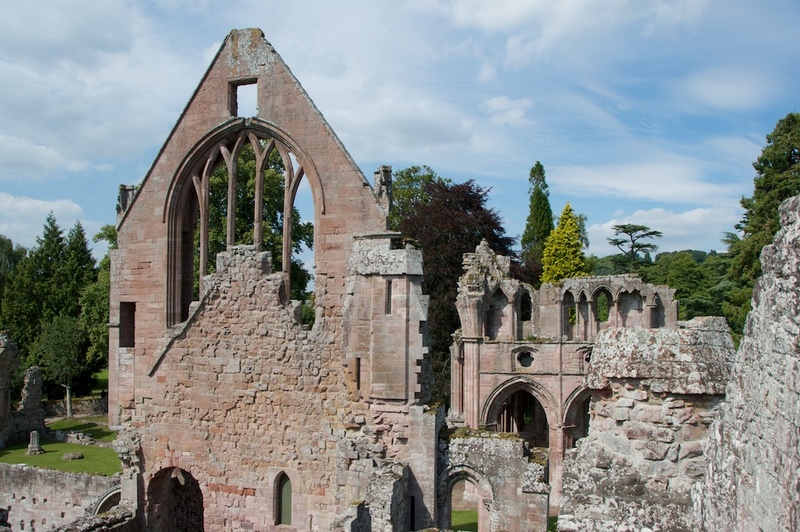 Yes, you’d love Dryburgh, and Jedburgh Abbey as well – Jedburgh is especially dramatic as you can stand centrally on an upper storey and get the perspective of arches and the tower. Fab post, Jo! The story about the monks ringing the bells too early, and the attack by the English army is fascinating. Not heard that before! I love the trees there as well. One of my favourite abbeys!